This is my very first project and now I am addicted. 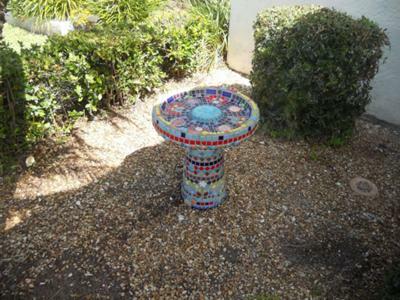 My neighbor was moving and gave me this old birdbath and I thought I would give mosaics a try. This was about 2 months ago and now I make time to do as much as I can. This includes searching out flea markets and thrift stores to locate "found items". I am having a great time! !